Golf carts are becoming a common sight as more people begin to use them as multi-purpose vehicles. 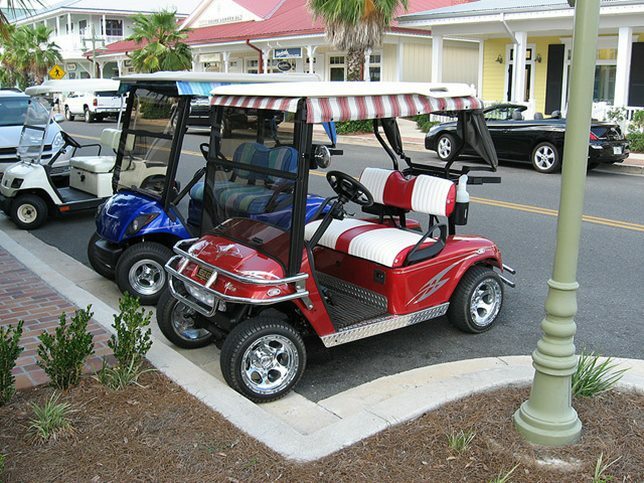 In addition to transporting golfers around the course, they're used in retirement communities, resorts and some malls. Learning how to take care of your golf cart will ensure it lasts and save you the expenses of repairs along the way. Before you put on your fix-it cap, a few words of caution. When maintaining your golf cart, wear safety goggles and gloves before poking around. Always turn off the batteries and lights. When adding air to tires, be careful not to over do it. The battery is one of the highest maintenance parts. Not to be confused with the type of battery that powers cars, these are deep cycle batteries so they can be used at a lower voltage. Carts typically have 4 to 8 batteries of 6 volts each and work in a system requiring 12 or 24 volts. Batteries require a charge and yet every cycle reduces the amount of charge they hold. Extend their life span with regular shallow charging as deep discharges drain them. Use a quality charger designed to bring them to high voltage every time. Aside from proper charging, the main thing to look out for is maintaining the right water level in battery cells. Charging them causes the water to boil and evaporate. Top them off with distilled water to maximize battery life. Clean the battery terminals frequently so they operate efficiently. This also enables the charger to correctly asses the status of the charging cycle. If you hear a clicking sound when stepping on the accelerator while the cart is running it's probably starting to stick. Check your warranty before bringing it to any mechanic. Some cart dealers have their own shops that the warranty requires you to use. If the cart's power seems to decline up hills your battery connection may be loose or they may need a charge. Check their levels and see if the connection is loose. If the problem persists and the batteries are more than 5 years old it may be time for new ones. An over-inflated tire can burst while a low pressure one will burden the engine and decrease your mileage. Check the required level for your tires and make an effort to keep it consistent. Connections between the batteries and electrical fittings can become faulty over time. Loose connections may cause the cart to malfunction so you want to keep an eye on them. Use a wrench to regularly check and tighten them. Weather enclosures make golf carts much more durable. They also keep occupants comfortable and dry. Popular models come in side panels that roll up when you're not using them. Made for standard cart sizes, they're simple to install with no drilling needed. These vehicles are small but they can get dirty. Clean it regularly to prevent stains and corrosion. Wipe off the seats and give the floor a quick vacuum to keep it tidy and free of crumbs and clutter. Learning how to take care of your golf cart is relatively simple and even kind of fun. They're an ideal form of green transportation so they're worth a little effort. Get to know the parts of your cart and keep a jug of distilled water, a wrench and other basic maintenance tools on hand. Pay attention when things don't feel right and make note of unusual sounds. Addressing small issues today prevents them from becoming bigger problems tomorrow.